During a special time in August, called the “can�cula” (star Sirius was called Canicula,�“little dog”, and refers to the hottest�“dog days” of summer), Tanhoc experiences about 15 days of little or no rain, making it an ideal time to harvest�ayote�(called "pepitoria" by local farmers), a�type of squash. Tanhoc is in its fourth�year of growing ayote for its delicious seeds. Pepitoria is really the powder that results from roasting and mashing up the seeds ("pepita", in Spanish) that is then used in recipes like�Joc�n,�Pollo en pepitoria�and�others. It is also delectable with green mangos, salt and lime! At the end of the five-month growing season, farmers enjoy a generous increase in their income, as this crop has grown in popularity in all the region of the�Pet�n. This kind of squash is easy to maintain because the rain doesn’t ruin the seeds inside. It also has a good market price, sometimes quadruple the prices of beans or corn. 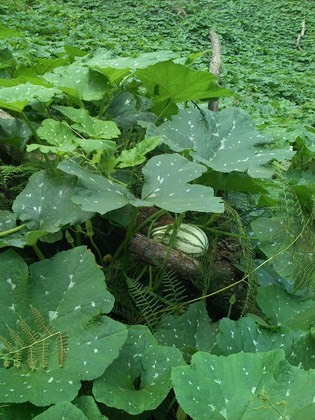 Pepitoria squash growing in a field. 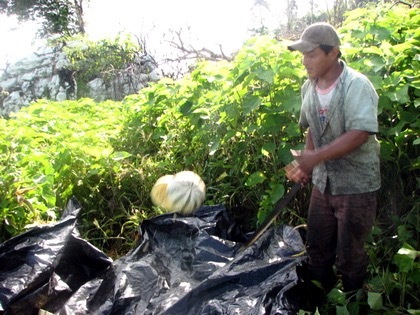 Francisco Cuz in a pepitoria squash field. 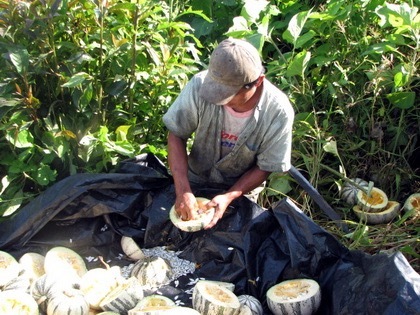 At harvest time, the farmers group the squash into several large piles in their field. 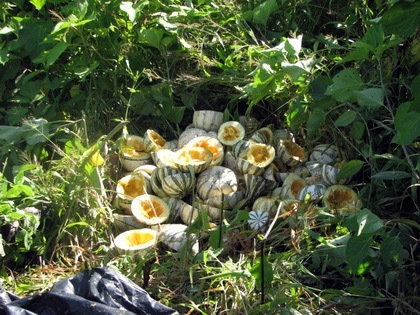 After collecting enough, they toss each squash in the air and slice it in half with a machete. Slicing the pepitoria with a machete. When all have been sliced open, the farmer drops to his knees and begins to dig out the seeds. They toss the fruit aside to give back to the earth, and gather the wet seeds to take home. Once at home, the wives will spread these sticky white seeds onto black plastic sheets on their front lawn or the soccer field. In this heat, it only takes an afternoon to dry seeds enough to take to market. 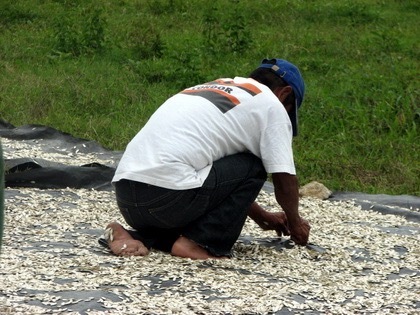 The dried seeds, with their shells still on, are sold to the bodegas (small stores) in�Popt�n. Local residents buy some of the seeds, for grinding into a powder ("pepitoria") used in�cooking�(see above). In March, farmers purchase raw seeds to plant next year's crop. 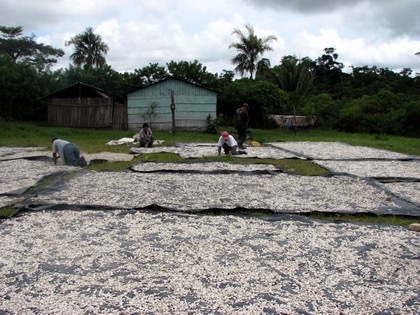 The remaining seeds are sold to two main large buyers, who then transport them to Guatemala City.�From Guatemala City, the seeds are trucked to�Rabinal�(Baja Vera Paz), where the shells are removed.�They are then transported back to Guatemala City, for distribution across the country (local markets) and for export to Mexico and the United States. In 2006,�Don Sebasti�n, a local resident of Tanhoc, received some pepitoria seeds and instructions from someone in Santa Marta, a neighboring agricultural cooperative. He planted them near his house and obtained a good harvest. This prompted many other farmers to notice and start asking questions. The next year, many cooperative associates were planting the new crop, enjoying the profits. 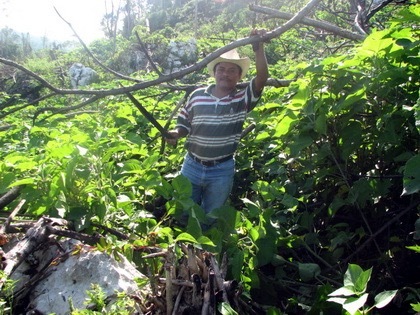 Don Sebasti�n didn’t give a course on how to grow pepitoria but simply instructed farmers individually. This year, almost everyone in the community is growing this squash, even doubling the amount they planted last year. Don Sebasti�n is well respected in Tanhoc, and although he is not an associate in the cooperative, he leads all Mayan religious ceremonies. It is important to note how influential one person in the community can be, as well as how the community is open to adopting innovative practices. At this time, there is only one planting of pepitoria every March. However, Francisco Cuz, local Pueblo Partisans Agronomist, is interested in experimenting with planting a new crop in October. This is a technique learned from a�permaculture�farm in San Andr�s, Pet�n. We will be traveling there once again to get more detailed information and advice on how to approach this new planting. Those associates in Tanhoc who are interested in experimenting with this new planting season will be accompanying us. We plan to visit other cooperatives that are harvesting the pepitoria, to compare results. There is currently limited information on how to obtain the optimum harvest, so sharing research results on local farmers’ experiences will benefit all farmers. If this crop is successful, the cooperative members may be able to secure a much higher price at market, further stabilizing their economic situation. We will also continue to investigate the history, use (medical, cooking) and marketing of this plant. Pueblo Partisans is interested in identifying "value added" activities to the production of the pepitoria (processing, packaging, direct marketing), because this is where the money is usually made. Additional information is available for the�Pepitoria Project.